Vitiligo is a pigmentary disorder characterised by depigmentation of the skin that results from a progressive loss of functional melanocytes. It has a profound psychological impact and greatly affects the quality of life. Medical therapy provides satisfactory results in stabilisation and re-pigmentation of vitiligo patches in a substantial number of patients. Vitiligo patients who are resistant to medical therapy pose a therapeutic problem to dermatologists. Stable vitiligo, which is described as vitiligo in which there is no expansion of existing lesions and no appearance of new lesions in the past 1 year,,, can be treated by various surgical procedures. Commonly practised surgical procedures include Thiersch graft,, mini graft, epidermal cellular grafts, punch grafts, suction blister grafts, melanocyte culture (MC) and grafting and autologous non-cultured melanocyte grafting., Non-cultured melanocyte grafting techniques were developed to overcome the time-consuming process of culture while at the same time providing acceptable results. Jodhpur technique used by the author is an autologous, non-cultured, non-trypsinised, melanocyte and keratinocyte grafting technique. This is the only technique that does not require split thickness graft and there is no need of trypsinisation. It is a simple procedure and is suited for developing countries where expert set-up for culture and trypsinisation is not available due to high cost. The background of this clinical study was a brief report published by the first author. 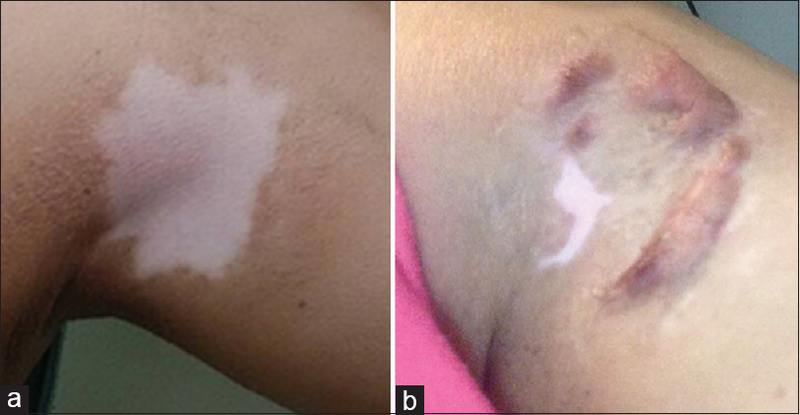 The purpose of this study was to investigate long-term outcome of this technique in patients with stable vitiligo. Our study was conducted on patients visiting the dermatology outpatient department of a tertiary health centre in Western Rajasthan. Patients with stable vitiligo, showing no expansion of pre-existing lesions or formation of new lesions over a period of at least 1 year, who were resistant to medical therapy were included in the study. They were treated with non-cultured, non-trypsinised melanocyte and keratinocyte graft between August 2005 and August 2011. Patients with Koebner phenomenon, bleeding diathesis, keloidal tendency, pregnancy, unrealistic expectations and age below 10 years were not included in the study. Patients were subjected to a thorough history and clinical examination. Written and informed consent was taken from all the patients. Permission from Ethical Committee was also taken. Photographs were taken before the procedure and subsequently after every 2 weeks. The degree of re-pigmentation was observed after 20 weeks and graded into excellent (>75% re-pigmentation), very good (50%–74%), good (25%–49%) and poor (<25%) by comparison of successive photographs of the patches by an independent observer. Equipment needed for this procedure was micromotor dermabrader/manual dermabrader, spatula/graft spreader, sterile petri dish and ointment-based topical antibiotic (Mupirocin 2%). Lateral area of the thigh was selected as a donor site in all the patients. Hair at the donor site was shaved off. Donor site was painted with povidone-iodine and then cleaned with spirit and 2% lidocaine was infiltrated. This was followed by application of antibiotic ointment to get a high yield of epidermal particles. Dermabrasion was done with the help of micromotor dermabrader at slow rpm till pinpoint bleeding was seen. The application of ointment to the donor area helps in preventing spillage of the graft and efficient trapping of the particles. In some cases, manual dermabrader was also used to obtain epidermal cells in the same manner as an electric dermabrader. Dermabrasion was then continued till the upper dermis and then stopped. 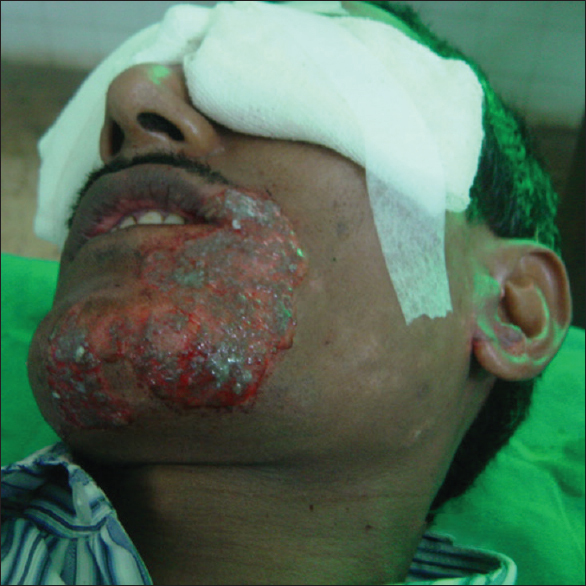 The paste-like material obtained by this procedure containing melanocytes, keratinocytes and dermis [Figure 1] was collected with spatula and was subsequently spread over the recipient area [Figure 2]. The donor area to be abraded is one-fourth the recipient area. Recipient site was prepared in the same manner as donor site except no harvesting of epidermal particles was done. The paste-like material obtained from donor site which contained epidermal cells was spread over the recipient area as a thin film. Dressing was done with antibiotic-soaked gauzes at both donor and recipient sites. After 10 days, dressing at both sites was removed. Both the sites were left without dressing. Patient was advised to apply topical liquid povidone-iodine daily with the help of a cotton swab, and oral antibiotics were given till complete healing of the recipient and donor site was achieved (14–18 days). Psoralen and ultraviolet A light (PUVA)-sol therapy was initiated 21 days after the procedure whereby 8-methoxypsoralen was applied topically followed by exposure to sunlight. This was done twice a week for a duration of 16–20 weeks. Patients who were in follow-up till 6 months after surgery were included in the study. After 4–6 weeks, re-pigmentation started all over the patch, and uniform homogeneous pigmentation was noted upto 16–20 weeks. 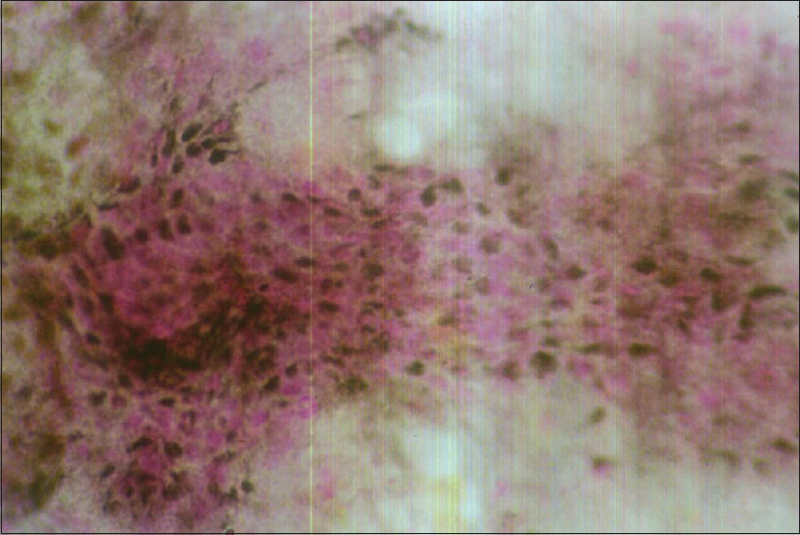 By comparing successive photographs of the treated patches, re-pigmentation was graded as excellent with 75%–100% ([Figure 3] and [Figure 4] showing excellent pigmentation), very good with 50%–74% ([Figure 5] showing partial pigmentation) and good with 25%–49% pigmentation of the area treated. Out of 437 patches undergoing procedure, 363 (83%) showed improvement whereas there was no or poor response in other patches. One hundred and seventy-nine patches (41%) showed excellent improvement, 114 (26%) patients showed very good improvement, 70 (16%) patches showed good improvement and 74 (17%) patches showed poor/no improvement. 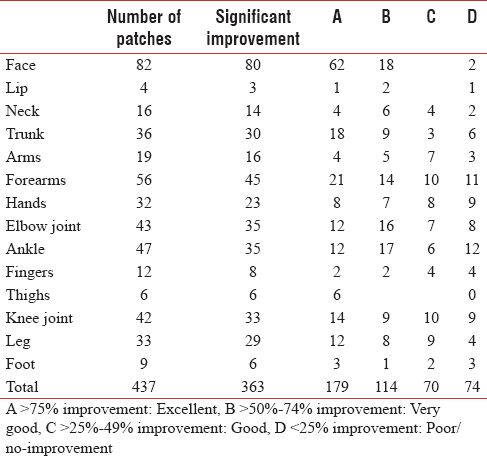 Best improvement was seen in the patches on the thighs, face and trunk where 100%, 75% and 50% of the patches, respectively, showed excellent re-pigmentation [Table 1]. Excellent response was seen in 62 (75%) patches on face, 1 (25%) on lip, 4 (25%) on neck, 18 (50%) on trunk, 4 (21%) on arms, 21 (37.5%) on forearm, 8 (25%) on hands, 12 (28%) on elbow joint, 2 (16.66%) on fingers, 6 (100%) on thighs, 14 (33.33%) on knee joint, 12 (36.36%) on leg, 12 (25.53%) on ankle and 3 (33.33%) on foot. Very good response was seen in 18 (22%) patches on face, 2 (50%) on lip, 6 (37.5%) on neck, 9 (25%) on trunk, 5 (26.31%) on arms, 14 (25%) on forearm, 7 (21.87%) on hands, 16 (37.20%) on elbow joint, 2 (16.66%) on fingers, 9 (21.42%) on knee joint, 8 (24.24%) on leg, 17 (36.17%) on ankle and 1 (11.11%) on foot. Good response was seen in 4 (25%) patches on neck, 3 (8.33%) on trunk, 7 (36.84%) on arms, 10 (17.85%) on forearms, 8 (25%) on hands, 7 (16.27%) on elbow joint, 4 (33.33%) on fingers, 10 (23.80%) on knee joint, 9 (27.27%) on leg, 6 (33.33%) on ankle and 2 (22.22%) on foot. Poor/no response was seen in 2 (2.4%) patches on face, 1 (25%) on lip, 2 (12.5%) on neck, 6 (16.66%) on trunk, 3 (15.78%) on arms, 11 (19.64%) on forearms, 9 (28.12%) on hands, 8 (18.60%) on elbow joint, 4 (33.33%) on fingers, 9 (21.42%) on knee joint, 4 (12.12%) on leg, 12 (25.53%) on ankle and 3 (33.33%) on foot. This group also included two patients who did not report for follow-up. The response of these patients was recorded over a telephonic conversation, and they were not happy with the response. Of the 425 patches of vitiligo vulgaris, 67% showed very good to excellent re-pigmentation. Nearly 71% patches of zosteriform vitiligo (5 out of 7) showed very good to excellent re-pigmentation. A single patch of congenital vitiligo showed no response. Acral vitiligo patches showed only poor to moderate re-pigmentation [Table 2]. One hundred and thirty-seven (46%) patches in the age group of 11–30 years showed excellent response. In the age group of 31–50 years, only 42 (29%) showed excellent re-pigmentation [Table 3]. Response in the age group 11–30-year was better than the age group 31–40 years possibly because people in the 11–30-year age group tend to be more cosmetically concerned and hence follow the instructions and precautions given during the treatment more carefully. Author observed no effect of associated condition on the outcome of the re-pigmentation of the vitiligo patches. Immediate side effects included minor burning and pain at both the recipient and the donor sites in nearly 90% of patients who were treated with analgesics (ibuprofen with paracetamol) during the first 2 days of treatment. Secondary infection was observed in <5% of the patients who were treated with suitable antibiotics. No keloid formation was observed, while hypertrophic scarring developed in one patient at the recepient site [Figure 6]. No incidence of scarring, milia or hyperpigmentation was observed. In our study, response was graded as excellent, very good, good and poor as per re-pigmentation percentage of 75%–100%, 50%–74%, 25%–49% and <25%, respectively. Our study showed more than 75% re-pigmentation in 50% of the patients. Our results are almost comparable to the study by Mulekar et al. which used autologous non-cultured trypsinised cellular grafting technique and reported more than 65% re-pigmentation in 61% of patients. A study conducted by van Geel et al. using non-cultured epidermal cellular grafting technique reported more than 75% re-pigmentation in 71% of patients. Verma et al. in a comparative study of cultured versus non-cultured melanocyte technique reported more than 70% re-pigmentation in 61% of patches with autologous melanocyte-rich suspension (AMRCS) and 52% of patches with MC technique. Pandya et al. reported an excellent response in 52.17% of cases with AMRCS technique and in 50% with the MC technique. Maleki et al. in their pilot study on suction blister grafting technique reported complete re-pigmentation in 70% of the cases. Characteristics of population and the method of evaluation are different in our study than the other studies, so it is difficult to compare our results with them. In our study, lesions on thigh, face, trunk, face and lips showed maximal improvement while patches on joints and acral areas did not show much improvement. Melanocytes and keratinocytes entrapped in the dermabraded recipient site undergo imbibition into the donor site during the first 7 days, after which the re-pigmentation is further accelerated by PUVA-sol. Multiplication of melanocytes at the recipient site is helped by various growth factors and melanocytes released during the healing process. A small donor area is able to re-pigment a larger recipient area because cytokines released by the keratinocytes help in melanocyte proliferation in the recipient area. Although the use of non-cultured melanocyte and keratinocyte suspension techniques has effectively reduced the duration of vitiligo surgeries, these techniques still need trypsinisation and preparation of a donor epidermal graft which takes nearly 24 h. This new technique uses melanocytes and keratinocytes trapped in the ointment base to be spread over the recipient area, thus eliminating the use of a donor skin graft. As a result, the whole procedure becomes easy to perform without any special training and can be done within an hour. There is no need of an expensive set-up for culture and trypsinisation. This technique produces uniform and cosmetically acceptable pigmentation. Furthermore, there is no scarring at the donor site and no cobblestone pigmentation of the recipient area. Pigmentation in the recipient area was stable over the mean duration of 6 months of follow-up. In this study, electrical as well as manual dermabrader was used, and the response of re-pigmentation was the same. Disadvantages include delayed pigmentation, and graft rejection may sometimes occur. Dressing has to be removed with utmost care taking into consideration the dislodgement of melanocytes. Epidermal cells obtained for transplant during the procedure are not as rich as obtained by other techniques using cultured as well as non-cultured melanocytes. Author suggests dermabrading till the upper layer of dermis to increase the number of melanocytes obtained from the donor site. Thus, to conclude, this technique which involves non-cultured non-trypsinised epidermal cell transfer is a cost effective, less time-consuming alternative to other techniques which involve trypsinisation of melanocytes and at the same time provides significant uniform pigmentation. Juhlin L. How unstable is the concept of stability in surgical repigmentation of vitiligo. Dermatology 2000;201:183. Lahiri K, Malakar S. The concept of stability of vitiligo: A reappraisal. Indian J Dermatol 2012;57:83-9. Lahiri K. Stability in Vitiligo? What's that? J Cutan Aesthet Surg 2009;2:38-40. Behl PN. Treatment of vitiligo with homologous thin Thiersch grafts. Curr Med Pract 1964;8:218-21. Behl PN, Bhatia RK. Treatment of vitiligo with autologous thin Thiersch's grafts. Int J Dermatol 1973;12:329-31. Lahiri K. Evolution and evaluation of autologous mini punch grafting in vitiligo. Indian J Dermatol 2009;54:159-67. Maleki M, Banihashemi M, Sanjari V. Efficacy of suction blister epidermal graft without phototherapy for locally stable and resistant vitiligo. Indian J Dermatol 2012;57:282-4. Pandya V, Parmar KS, Shah BJ, Bilimoria FE. A study of autologous melanocyte transfer in treatment of stable vitiligo. Indian J Dermatol Venereol Leprol 2005;71:393-7. Gauthier Y, Surleve-Bazeille JE. Autologous grafting with noncultured melanocytes: A simplified method for treatment of depigmented lesions. J Am Acad Dermatol 1992;26(2 Pt 1):191-4. Ramos MG, Ramos DG, Gontijo G, Ramos CG, Rocha TN, Rocha RH. Non-cultured melanocyte/keratinocyte transplantation for the treatment of stable vitiligo on the face: Report of two cases. An Bras Dermatol 2013;88:811-3. Kachhawa D, Kalla G. Keratinocyte-melanocyte graft technique followed by PUVA therapy for stable vitiligo. Indian J Dermatol Venereol Leprol 2008;74:622-4. Mulekar SV, Al Issa A, Al Eisa A. Treatment of vitiligo on difficult-to-treat sites using autologous noncultured cellular grafting. Dermatol Surg 2009;35:66-71.
van Geel N, Goh BK, Wallaeys E, De Keyser S, Lambert J. A Review of Non-cultured Epidermal Cellular Grafting in Vitiligo. J Cutan Aesthet Surg 2011;4:17-22. Verma R, Grewal RS, Chatterjee M, Pragasam V, Vasudevan B, Mitra D. A comparative study of efficacy of cultured versus non cultured melanocyte transfer in the management of stable vitiligo. Med J Armed Forces India 2014;70:26-31.